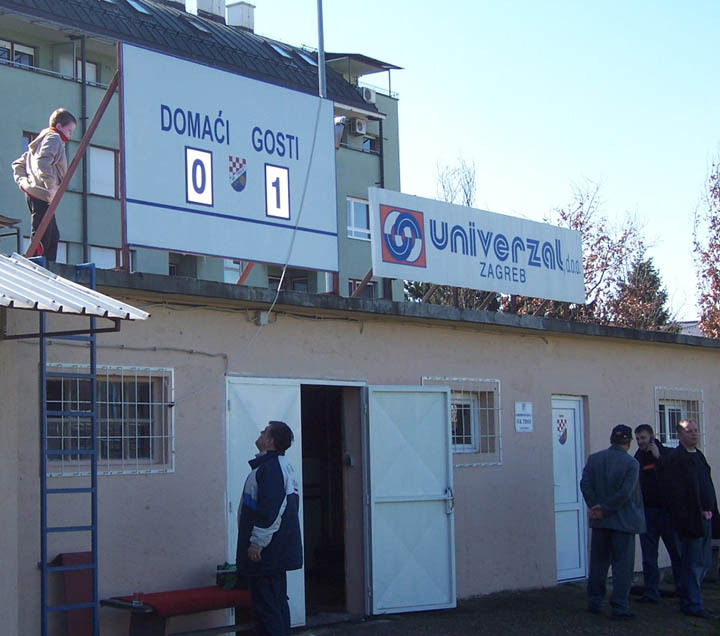 Yes, the Četvrta Hrvatska Nogometna Liga Središte podskupine ‘A’ or, if you like, the Croatian National League Fourth Division Central Group A. Regular readers might be thinking that I’m just being wilfully obscure now, and you’d be right. This is one of eight leagues at this level; two groups each in the north, south and in the centre and one each for the clubs in the east and west. Only the top three levels in the country are organised by the Croatian Football Federation, so I guess you might call this ‘non-league’ if we follow the English pattern. 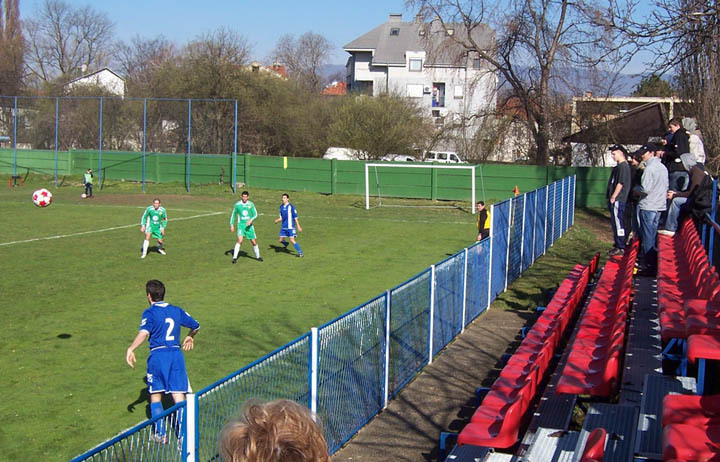 It’s fairly simple to find a game in Zagreb on any given weekend: two clubs in the First (Premier) League, one in the second league and five in the third, along with the ten in Središte podskupina A. On top of that, at the fifth level, there are nineteen leagues, one of which covers Zagreb County, another catering for Zagreb itself. Saying that, trying to find fixture lists in advance isn’t the easiest task, particularly without a command of the Croatian language. However, being a librarian by trade and this being the twenty-first century, interweb search strategies should indeed be my game, and eventually NK Maksimir’s website delivers the goods. Having a great deal of information for their league in general was particularly useful considering that most clubs don’t appear to have a website of their own. With NK Zagreb already booked in for the Saturday, and me leaving the country the following afternoon, I’d been hoping for a Friday evening kick-off somewhere but, as it turned out, NK Trnje regularly play their homes games at 10am on a Sunday morning. Considering their location very near the centre of Zagreb, and the fact that the Prva Liga sides will usually be playing on weekend afternoons, this is no doubt a gambit to draw in a few extra punters. 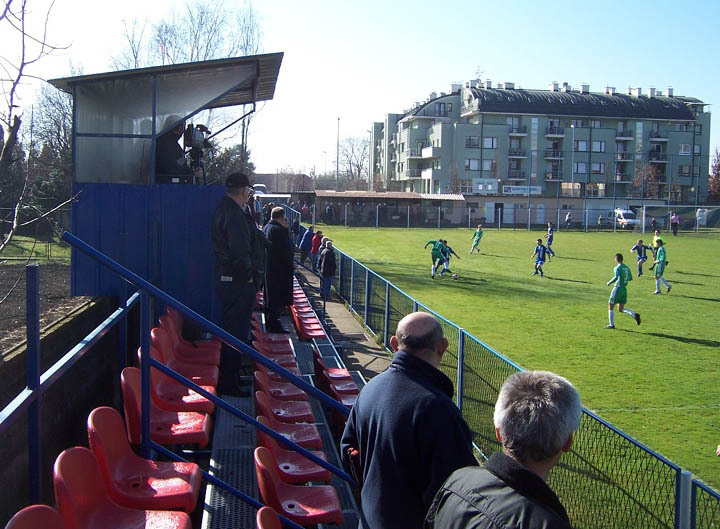 On arriving at the ground, the entry fee hadn’t been written up anywhere so I just handed over a 20 kuna note and, gaining no reaction, kept handing over coinage until the gateman’s face took on a bewildered “Who is this mysterious unshaven tycoon. And what does he want?” look. After doing my famous “Engleski” bit, he gave me a confused, but financially happy grin, shepherded me through the collection of fellas by the turnstile, then pointed me in the direction of the “tribune”, a collection of 200 prefab seats down the nearside touchline on the other side of the dressing rooms. The Sunday morning kick-off time clearly works best when playing other teams in their league from the Zagreb conurbation, as was the case today. An acne of teenagers with squeaky horns from Ponikve gathered at the far end of the seating, perched on the fence that runs behind it. Before kick off they began singing their songs, some of which appeared to be about Dinamo Zagreb - one assumes in a positive sense. 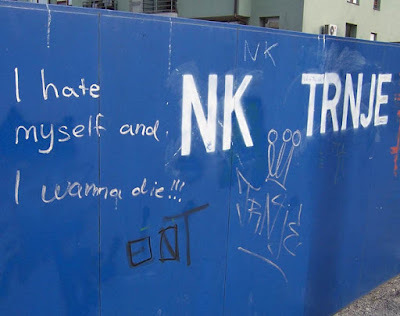 Their version of ‘Guantanamera’ did, however, appear to reference “Ponikve Zagreb”, while another chant followed the tune of Auld Lang Syne. Another chant seemed to be “Tony Greig, Tony Greig” but I’m assuming that’s down to my tinnitus-pinched hearing rather than the South Africa-leavin’, West Indies-baitin’, “wilcome to ah telecawst”-sayin’ former England cricket captain actually being a major celebrity out here. The teams came out and, as is the European style, lined up together as one single string. However rather than face the stand, they stood looking straight into the eyes of those on the dug-out benches on the far-side, those whose starting places they have commandeered. Given this stand-off, it’s a genuine surprise that they don’t start flicking V’s and bogies at each other. The teams then did their intros, with high fives all round. At this point, several faces appeared over the far-side wall, it being shallow enough at points to not even require a box for standing on. Inside the ground, some paying spectators choose to eschew the seats, still wet from the previous days rain, and stand behind the gate-end goal, faces pressed up against the fencing, thus running the significant risk of getting some reverb squarely in the mush from the kids booting a football repeatedly against the far end of it. As might be expected at this level, it’s pretty physical and while generally the pace of the Croatian game is somewhere between measured Italian and frantic British, you can be sure of a few good old doggers in the lower leagues wherever you go, with plenty of ankle-tapping going on in the early stages. Four guys went to stand near the teenage away support to bellow a few songs of their own. Two nippers, both about the size of an office fire extinguisher, stood with them to join, one of them by rapping on a toy snare drum tied round his neck with string, the other by blowing on a kazoo/comb n’ paper-like instrument that looked like a toppled beer can. On the field, both sides looked to be having some trouble getting into the game, giving the ball away on a regular basis. There were no real chances until the 22nd minute when a Trnje centre-half powered a header wide. At this point a Trnje fan borrowed the kid’s can-horn thing, leant over the fence and blew it right into the passing linesman’s ear. Chances came at both ends prior to half-time, with the home side largely having the better of it; the Ponikve keeper having to make a couple of fine saves. The second half began much as the first had finished; a Trnje striker breaking through the defence, rounded the keeper but had been drawn wide so that after firing into the mix, the ball was easily cleared. 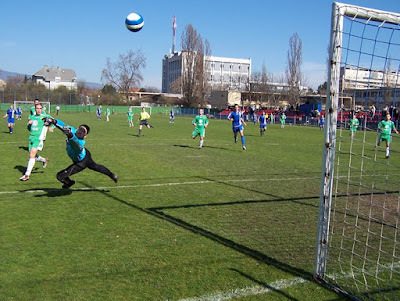 Trnje’s momentum was building, passing the ball around with confidence, one shot from twenty yards curving wide of the far post, another causing the keeper to athletically tip the ball over (see picture above). Shots were flying in from all over, but to no avail as against the run of play, Ponikve stormed straight up the other end and placed the ball past the keeper to take an unexpected lead. Now bristling with confidence themselves, Ponikve then began to press for a second. Their tall left-back, apparently Cristiano Ronaldo after an overdose of growth hormones, capitalised on a slip before executing a handsome outside-of-the-boot lob that was heading for the top corner before the keeper managed to get back and paw the ball away. It was the keepers who were to remain at centre stage as the Ponikve keeper had to achieve similar acrobatics two minutes later. Yet his team almost wrapped it up in the last moments with Trnje stretched, a midfielder speeding into the box before sidefooting a shot that spun across goal and wide. Thus, 1-0 to the away side it finished; one of the small boys that had been kicking around behind the goal forlornly climbing the ladder up the side of the clubhouse to pack away the scoreboard numbers. Trnje aren’t safe from relegation yet, only five points ahead of Klanjec and Schiedel in the zone, which may explain the rather gloomy statement graffitied onto a side gate (see above). My friend on the gate doesn’t seem too perturbed though, giving my shoulder a hearty slap on my way out and asking “good?” “Yeah, good” I say, assuming we’re talking about the general NK Trnje experience. If we’re talking about the result, I may just have broken his heart.